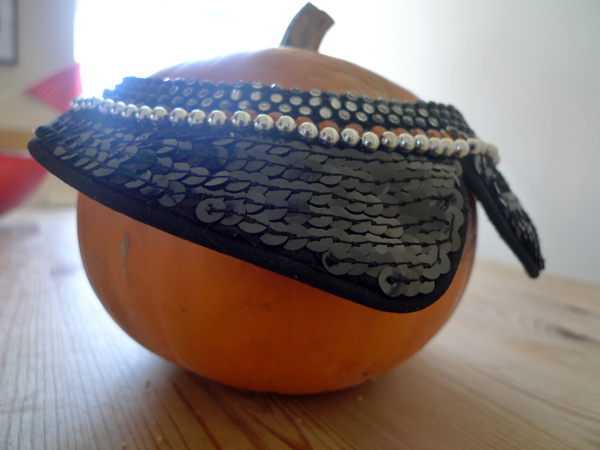 I have a bit of a thing - no wait - I'm a little bit crazy about sequins. Even on sportswear. Even on a bally grey sweater. Blame it on an adolescence spent on the figure skating rink, I have a weakness for the stuff. 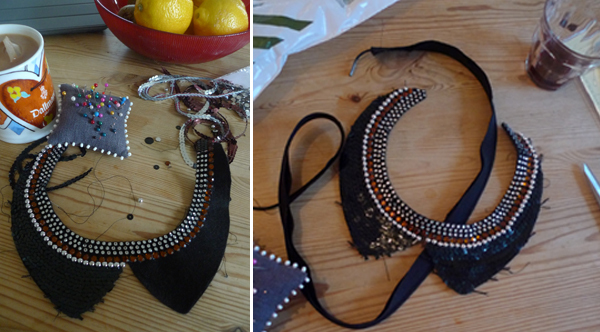 Recently I decided I had to try my hand at one of these beaded collars that are everywhere right now (actually I think the exact moment was during an episode of Strictly Come Dancing). Once I got started I couldn't put it down. Notice the transition from tea to wine. Or was it the other way around. There are already countless tutorials on how to make your own beaded collar and I don't think you can go wrong. It's as simple as measuring the circumfrence of your neck (or using the front and back neckline of a pattern that you like) and drawing in a collar shape. To assemble mine, I sewed on the beading and sequins, to keep it flexible, and used a little glue for those plastic orange ones I mentioned earlier. The collar is a lightweight piece of felt backed with another piece of felt, with piping sandwiched between the two to create a smooth edge. Now I've earmarked the last scrap of fabric from my dolce vita dress for a sparkly grey and pink collar that fastens in the front. 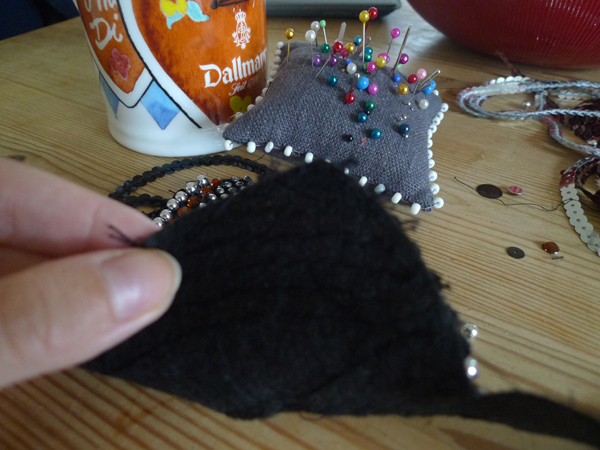 For a while I thought these scraps would be destined for a very glittery length of bunting. Now maybe I'll have lots of very sparkly collars. p.s. Just noticed the professional photos are up for the Tessuti Awards. Check out the amazing pictures here. Thanks I hope you do! This is amazing! I love your idea to add piping. I'm mad about piping. Than you! Ah I love piping too....!